Let’s face it – if you haven’t heard the new F8X BMW M3/M4 twins’ factory exhaust, you’re one lucky son of a batch of cookies. To put it plainly, the stock exhaust on BMW’s latest M & M combo sounds absolutely horrific! Some have likened the sound to that of a weed whacker – not exactly what new customers would expect to hear coming from a car that carries such a legendary lineage. Naturally, this didn’t sit well with us. So, we decided to do what we do best – engineer a top quality performance exhaust system that not only looks and sounds great, but adds a good amount of power as well. Once we began our R&D process we realized the OEM design not only caused a horrendous tone; it was also incredibly restrictive – robbing the car of valuable horsepower. Thankfully, 30+ years of experience developing BMW ///M chassis performance pieces has served us well. We quickly identified which design features required improvement. We were on our way to discovering the perfect blend of sound and exhaust flow we were after! Besides the highly restrictive secondary catalytic converters all manufacturers are required to implement in their OEM designs; the stock F8x exhaust system also makes use of two silencers (aka mufflers), which help dampen noise levels and meet EPA requirements. Unfortunately, these requirements greatly hinder all-out performance. 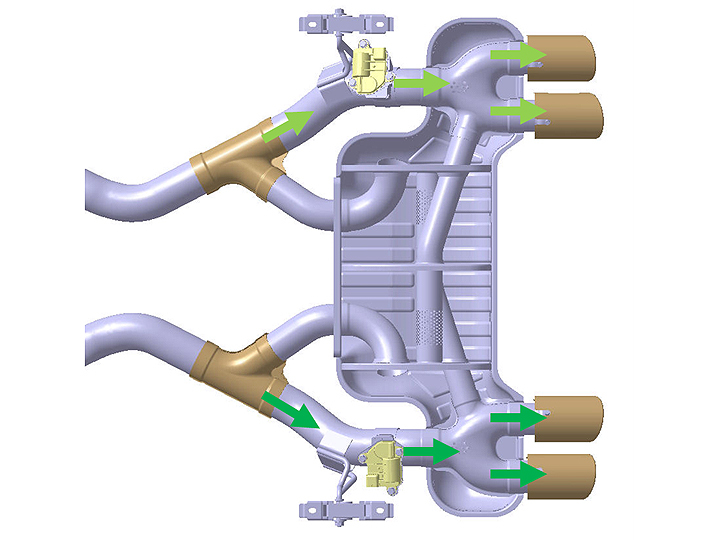 The first silencer (BMW refers to it as a “resonator”) is actually located in the middle of the exhaust system. Meant to enable “cross-talk” between each exhaust pipe in order to dampen the sound, this middle silencer actually bottle-necks exhaust flow even before it reaches the rear silencer. Further downstream is the more intricate rear silencer. This one incorporates electronic valves to control noise dampening. While this design is necessary to meet strict manufacturing standards, it is not advantageous for enthusiasts that crave additional horsepower and enjoy a deep, powerful exhaust tone. Creating an exhaust that exhibited a sound deserving of the ///M badge was high on the priority list; but developing a much less restrictive unit was our primary focus. However, doing so was no easy task. After a lengthy discussion, we decided on a design for those more concerned about improving performance than preserving their factory warranty. 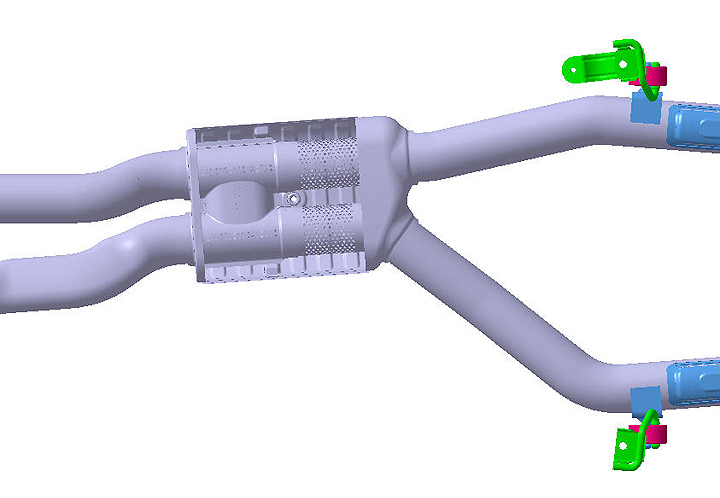 We first eliminated the secondary catalytic converters on the mid pipes – rendering our F8x M3/M4 mid pipe for off-road or track use only. However, the system still wasn’t free-flowing enough for our power goals. After a barrage of testing, we ultimately decided the scrap the center silencer and the dual mid pipe design altogether. Finally, we were faced with engineering a replacement for that mess of a rear muffler. While we understood the reasoning for the factory design – we knew it could be improved upon. Similar to the process we undertook with the mid pipe, developing a satisfactory rear section consisted of a lot of trial and error. In the end, we were surprised to learn that this portion of the exhaust had much more influence on the overall sound than even the mid pipe! Eventually we came up with the final tri-muffler design you see here. 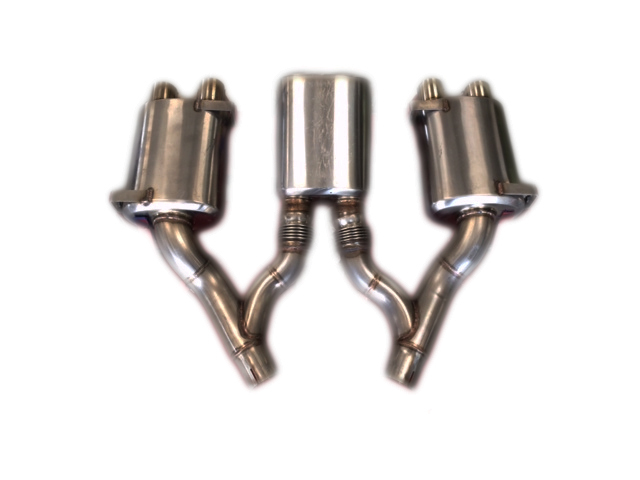 The complete system relies on all three mufflers to dampen sound, without the use of electronic valves or complicating exhaust flow. The gasses now flow freely and without re-direction. The magic behind the design is in that third muffler. It acts as a crossover, assisting with cleaning up that uneven, out-of-sync sound while also helping provide a nice throaty rumble any ///M owner would be proud of. Now that you’ve learned how and why we designed our F80 BMW M3 and F82 M4 exhaust system the way we did, you can see why it has taken so long for us bring the final product to market. After you hear this setup in person, you’ll understand why perfection doesn’t happen overnight! 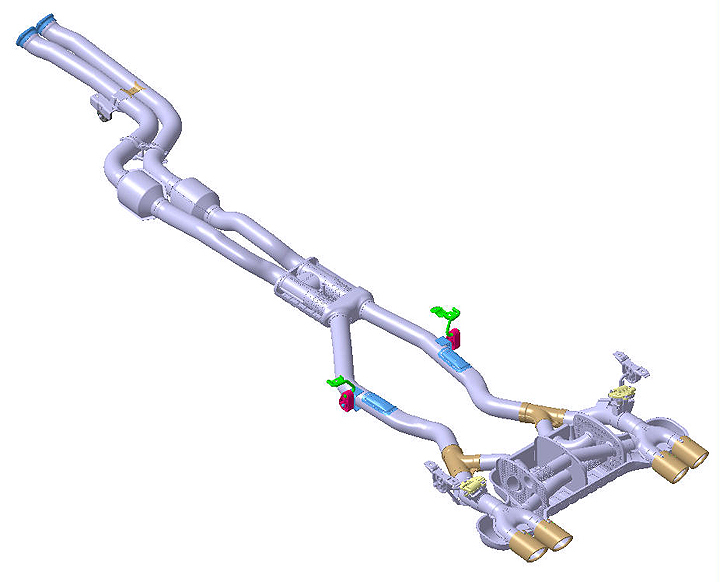 For more in-depth information about the factory BMW M3/M4 exhaust, see this thread on BimmerPost.